Male Roosevelt elk seen on Derek Melton’s Isabella Point Road property on April 10. The Salt Spring wildlife catalogue got an exciting new entry last week with the appearance of two Roosevelt elk on the south end of the island. Numerous independent reports were made from April 9 to 11, and BC Conservation Officer Scott Norris confirmed that one photo taken was definitely of elk. Derek Melton snapped a photo of the two young males as they passed through his garden on Isabella Point Road on Tuesday, April 10. “I just happened to be doing some work inside and looked out the window, and couldn’t believe my eyes,” said Melton, who has seen elk before in the Rockies. “We have lots of deer but they were more than twice the size of the deer,” Melton added, noting that elk also have distinctive rear ends and manes. Other islanders’ reports suggest the elk were walking a large range. Jamil Hart-Weller called the Driftwood on Wednesday to report seeing the two males on King Road near Ruckle Park. “I’ve been on the island for 40 years and I’ve never seen an elk here,” Hart-Weller said. The closest point between the two islands, which falls near the protected areas of Stoney Hill Regional Park and Burgoyne Bay Provincial Park, may be as little as 600 metres. Cougars and bears have made the swim before. Norris said he’s never heard of elk doing it, but can’t rule it out. “It’s possible. Elk can swim, but they generally aren’t strong swimmers,” Norris said. 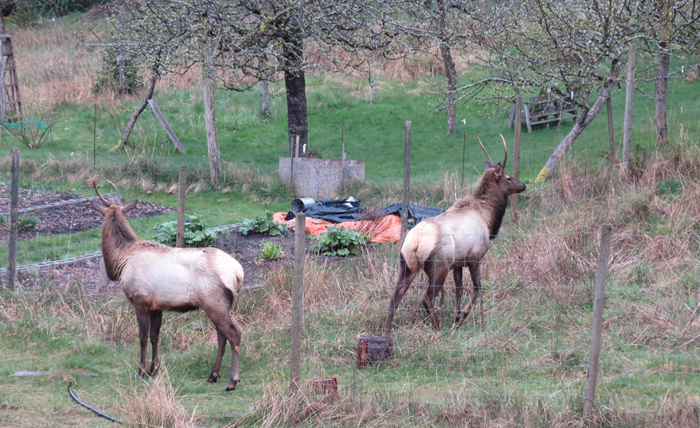 The conservation office would greatly appreciate receiving direct reports from anyone who sees elk on Salt Spring. Sightings as well as reports about Wildlife Act violations can be made to the RAPP Line (Report All Poachers and Polluters) toll free at 1-877-952-7277 (RAPP), or by visiting www.rapp.bc.ca.